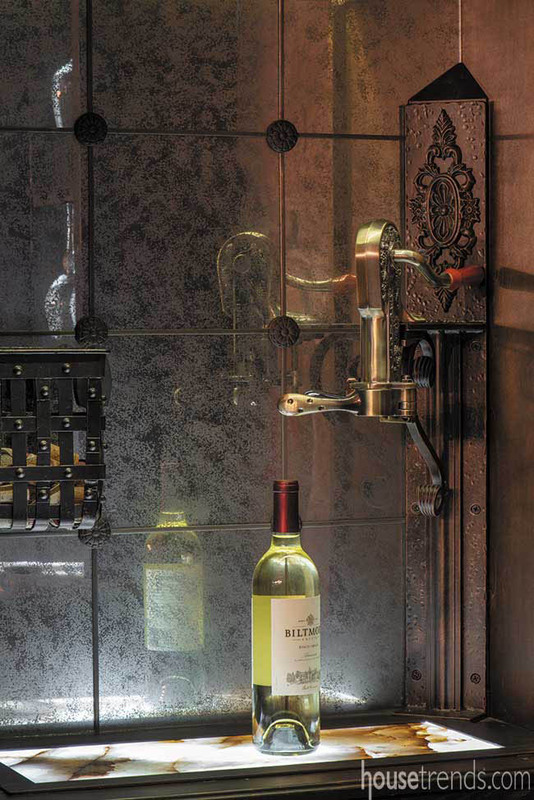 Visitors to the wine room are surrounded by beautiful details like the arched brick ceiling and built-in storage for 450 bottles. The table and chairs, and everything else, are custom. 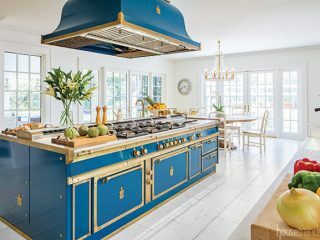 There is a place where countertops glow and fine wine flows, where friends gather to bask in, or take shelter from, the elements, where every detail of beauty and comfort has been embraced so that all that remains to be done is enjoy them. 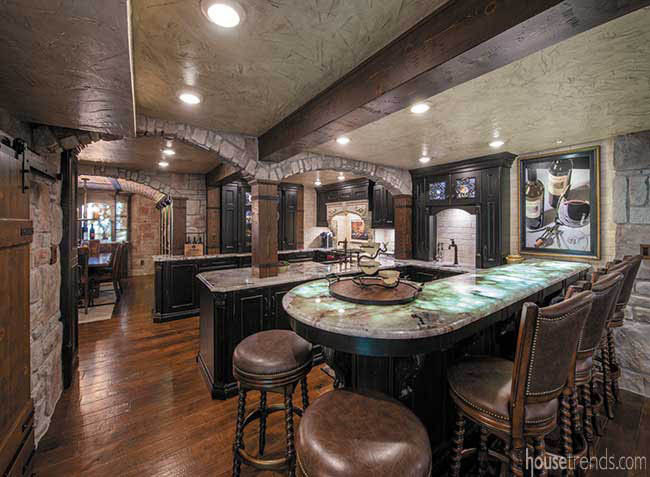 This exquisite and intoxicating oasis is known as…a basement in Brecksville. 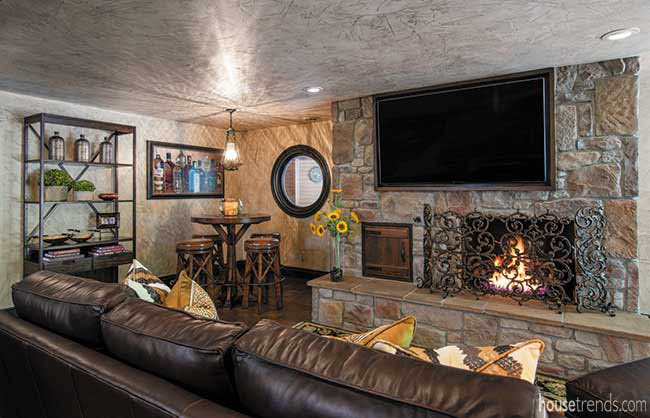 For visitors, the word “basement” never actually comes to mind, and homeowners Mary Ann and Dennis Bednar have fittingly christened their newly remodeled lower level “Bella Casa” because it is indeed the basement that doesn’t seem like one at all. 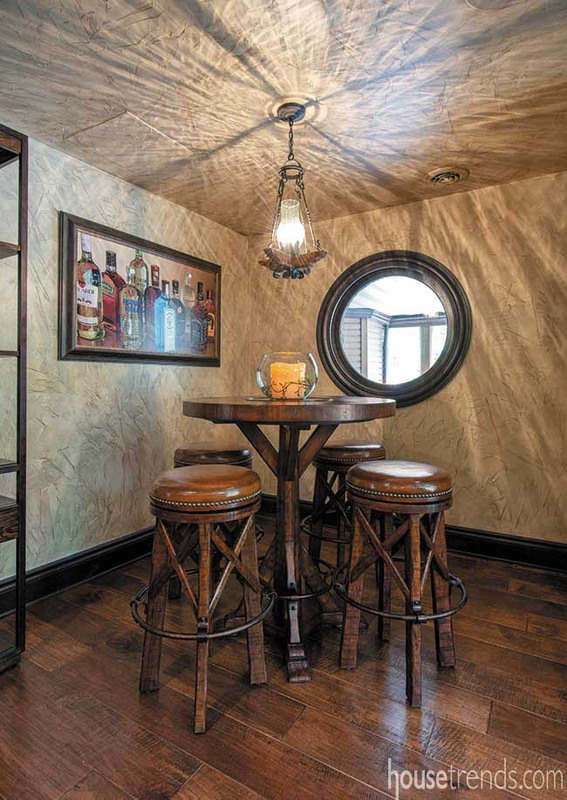 The Bednars knew they wanted an old-world, Tuscan-inspired space. 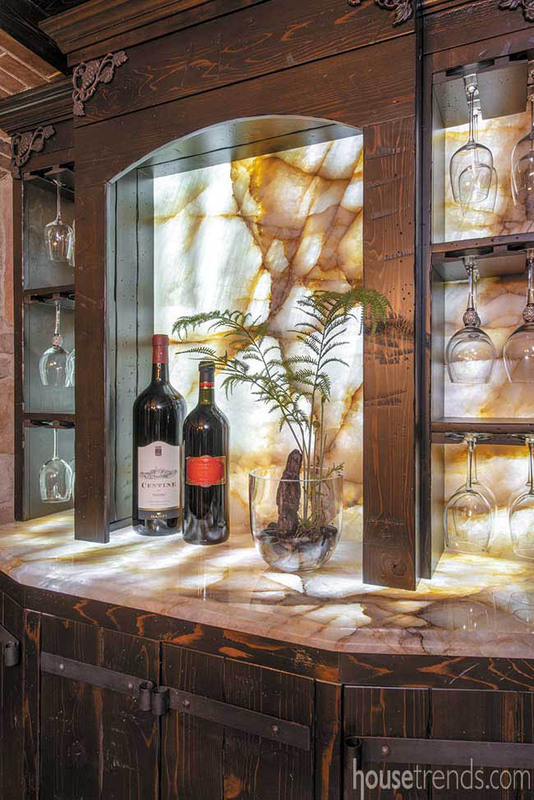 “We knew we wanted a wine room and complete bar and kitchen and cigar room,” says Mary Ann. “We didn’t know how to get it to work. They made it work,” she adds, referring to Architectural Justice, the company that brought the project to life. The Bednars lived in this house for decades. The basement started out as a typical concrete-and-cinder-block affair that later included a laundry area, bare-bones exercise space, a barely functional bathroom, and the humble beginnings of a business (which now employs 140 people). Built as a ranch in 1948, the house underwent three additions, including one to add a second level. 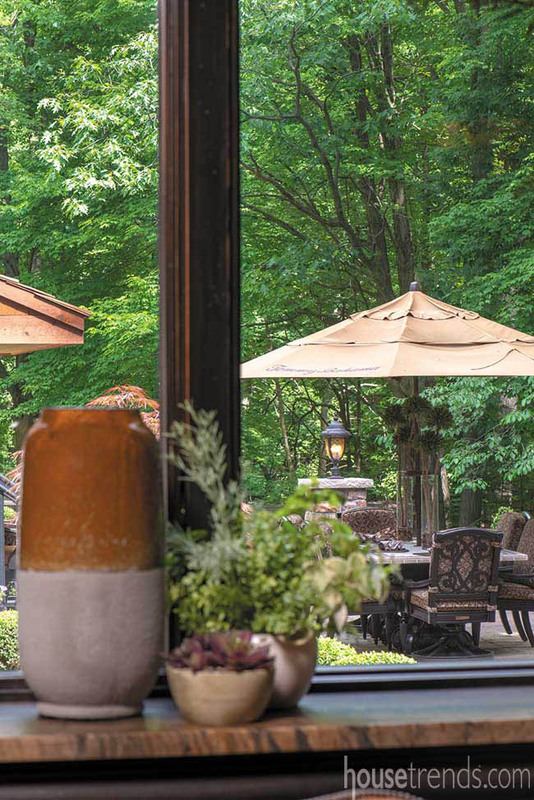 A few years ago, Mary Ann and Dennis brought in Sal’s Landscaping of Brecksville to add a dramatic outdoor living space. Finally, it was time to make the basement beautiful for its own sake, and also to blend with the stylish patio space beckoning just outside the glass basement doors. While browsing appliances at Trevarrow, Inc. of Parma, the Bednars admired the in-store display by Architectural Justice. Soon, owner James Justice and his wife and partner, Darlene, had begun the design process for the Bednar’s lower level remodel. Following several months of patient listening and re-working of drawings, they were ready to start the build. James continues, “We had multiple design meetings and tried to lay out each design meeting with the decisions that needed to be made.” First, they had to define the spaces, then materials, and then details. Software allowed the Bednars to virtually walk through the space before it existed in reality. 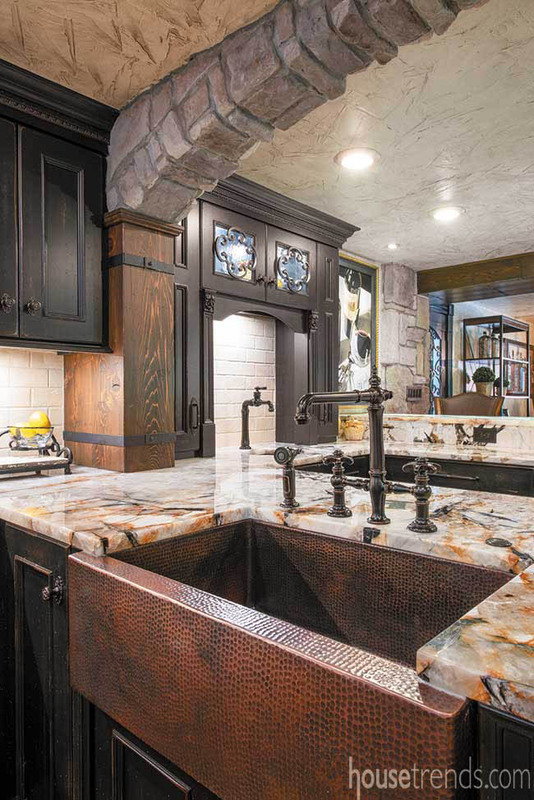 In the Bednar basement, warmth oozes from the cabinetry in an antique blackened finish, the hand-sculpted seven-inch-wide planks of American hickory floors, the stone and stucco walls, the iron scrollwork in the doors and stair railing, and so much more. The glowing countertops are natural Brazilian quartz artfully lit from below, enhancing their translucence. 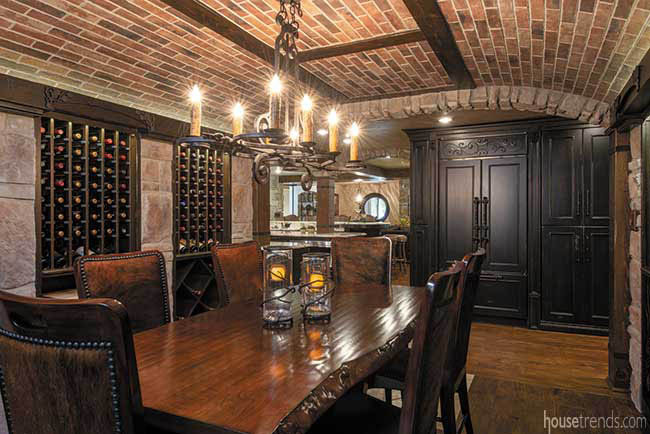 The wine room features an arched brick ceiling, walls of built-in storage for 450 bottles, a corking station, and a custom table and chairs. 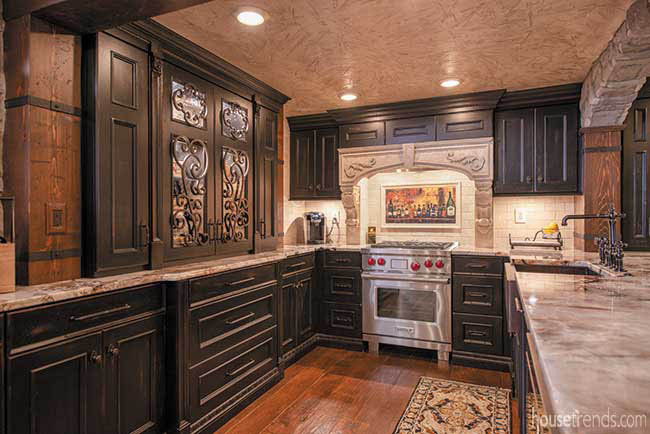 The backsplash at the kitchen cooktop features a one-of-a-kind mural printed on travertine tile. “That’s a photo of a real place in Tuscany,” Mary Ann explains about the mural. Mary Ann and Dennis purchased the digital file of the photo from a photographer. Then, James and Darlene transferred the image to the Bednar’s tile. They even altered the image so a previously blank wine bottle in the photo now appears labeled with Mary Ann and Dennis’ names and their fictitious winery. The vintage is 1995, the year of their marriage. Although the finished space feels large, open and flowing, that is due more to insightful planning, than to actual square footage. To achieve this, everything in this project had to be custom designed and built. Architectural Justice was up to the task. 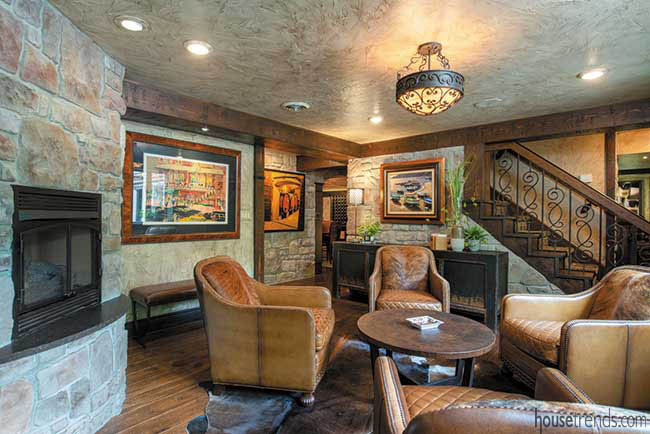 The cozy cigar room features custom hair-on hide seating, built-in cabinets that include a humidor, deep window wells and beautiful views of the outdoors, plus a venting system in the ceiling to keep the space smelling fresh. A spacious pantry fits under the stairs, behind doors that match the kitchen cabinets. There are two TVs and three gas fireplaces. A utility closet hides behind a beautiful sliding barn-wood door. A bathroom with marble counters includes a steam room/shower combo. Everything here is purposeful, intentional and well thought out and it is just that intense planning that makes it all feel effortless in this true Bella Casa.